HARRISBURG, Pa. (November 20, 2017)—The Central Pennsylvania Chapter of the Public Relations Society of America (Central PA PRSA) has named the best public relations projects of the year and honored a local public relations professional for career and service excellence. This year’s top projects—receiving either a Keystone Award or a Silver Keystone Award from Central PA PRSA—included efforts to raise awareness for Child Abuse Prevention Month, grow a digital grassroots community to become the voice of health care in Pennsylvania, celebrate the small businesses in a local plaza, and educate and celebrate employees at a local company. Central PA PRSA also honored Julian A. Richter with the 2017 Frederick E. Leuschner Award for his outstanding leadership to the chapter, the community, and the profession. The awards include two levels of recognition. Keystone Awards recognize outstanding achievements in public relations, marked by excellent results, thorough planning, game-changing ideas and creativity. Silver Keystone Awards demonstrated excellent planning and outcomes. Volunteers from the Southern New England chapter of PRSA judged the entries and considered research, planning, execution, and results of each project in their scoring. In addition to the Keystone Awards and Silver Keystone Awards, Julian A. Richter was presented with Central PA PRSA’s highest individual honor, the Frederick E. Leuschner Award, for his outstanding leadership to the chapter, the community, and the profession. Richter has served the public relations profession for more than 30 years and spent countless hours giving back through volunteer and missionary work, both within the Central PA PRSA Chapter and in many other organizations. Julian currently serves as a missionary working in the communications department of TeachBeyond, an organization that connects teachers with schools around the world. Julian works as part of the communications team on strategic planning and helps to tell the stories of TeachBeyond’s impact around the world via social media, video, email, and annual report. Julian also has served as the communications director for the Evangelical Free Church of Hershey, communications director for Black Forest Academy in Germany, account executive and copywriter for Godfrey Advertising, and in the corporate communications division of Hershey Entertainment and Resorts Company. This year’s ceremony was held on November 14 at “What If … West” restaurant and bar at The Coliseum in Camp Hill. 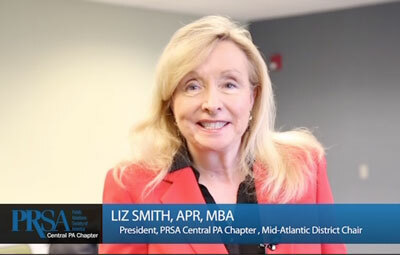 Milton Hershey School’s Lisa Scullin gave the keynote presentation on “The Balancing Act of PR.” Central PA PRSA President and Select Medical’s Greg Swartzlander served as the event’s emcee. About Central PA PRSA: The chapter was formed in 1959 and is one of the oldest chapters in the country. Its membership is represents a diverse group of professionals at all stages of their careers, including practitioners in corporate, government, nonprofit, education, health care, and association industries with a common desire for professional public relations practice and to continue education and the advancement of the profession. For more information, visit www.prsacp.org.